Last October, when the leaves were turning raspberry red, lemon yellow, and orange orange, I embarked on a serious mission to make myself feel more like a real writer. (www.inthewritersweb.com, Nov. 2016.) Although I took my writing seriously, it didn’t seem like I was doing enough. Like you, I spent my time setting yearly goals, working on a variety of manuscripts, submitting to agents for feedback, participating in writing/critique groups, taking classes, and going to conferences. I read blogs and books on craft. I wrote articles like this one. But despite this dedication, I still had no offers of representation or publication to show for myself. I had gotten very close with a few agents and editors, but that golden ticket still eluded me. And, I had reached a crossroads – give up on the whole shebang or amp up my life as a writer. Obviously, I chose the second option. (First sign of being a real writer!) Now I needed a new way to prove to myself that I was getting closer; that I was doing everything possible to increase my odds. So I came up with an idea. I decided to keep a daily log of everything I did that related to my life as a writer. As a teacher, I loved leafing through my over-stuffed lesson plan books to see how much I had accomplished with my students. There were scribbles in the corners of cramped daily squares and tattered pieces of paper shoved in between the pages. Everyday had been a whirlwind of accomplishments! Only with writing, planning out my week in advance often went awry. On some days, it seemed like I got very little done. I’d spend hours rewriting one chapter when I thought I’d be able to do four. Or I’d plan to do a small bit of research, get caught up in the subject matter and read articles on the topic for an entire morning. Finally, it came to me out of the clear blue – a totally different approach to this problem. I would log about what I did after I did it, not before. This way, I wouldn’t be disappointed if I didn’t accomplish what I thought I should have. I was doing a lot. 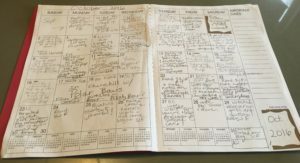 Seeing months of squares filled in with writing activities convinced me that I was doing all sorts of things to further my life as a writer. I included everything from working on my novels and going to conferences to doing research and reading books in my genre. I developed a habit. According to many experts, it takes at least 21 days to develop a new habit. And for most of us, it’s longer. By writing in my log every day for an entire year, I made being a writer a conscious part of every day. Reading counts. You must read to write. I made sure to log about the books I read, both in and out of my genre and on craft. Then I entered the titles onto my Goodreads page. I also included blogs, articles, and emails to my writing colleagues. Rewriting is very time-consuming. By writing down exactly what I did each day, I could see how long it was taking me to revise my novel. A looonnnngggg time. There was one week when I worked on my first page for five days in a row! I am part of a writing community. I saw how often I met with other writers, both individually and in groups. I included in-person writing groups, conferences and classes, as well as online blogs, workshops, emails, and texts. It was A LOT!!! I am improving my craft. I recorded all the classes I took, conferences I attended, books I read on craft, and the ways I was implementing changes into my manuscripts. So important. I took on more of a leadership role in the RMC-SCBWI. My board position as Exhibits Coordinator turned into the PAL LIAISON this year. Being involved at this level makes me feel more professional and has also has introduced me to an inspirational group of writers! At a recent writers conference, I was thrilled to share a lunch table with renowned editor, and author of THE MAGIC WORDS, Cheryl Klein. When Cheryl asked if I wrote every day, I told her about my writing log. She liked the concept and said that a daily writing practice is the key to getting published. So maybe I’m on my way! But here’s the main thing I discovered by keeping the log… getting published is only one part of living a writer’s life. It’s an extremely important part of the journey, but the things I wrote down in my log squares, … those are the things that make me a “real” writer. And here’s the surprising takeaway – I don’t feel the need to continue logging. A year of doing this has served its purpose. I am living the life of a writer. And I have a notebook full of scribbled-in boxes to prove it.